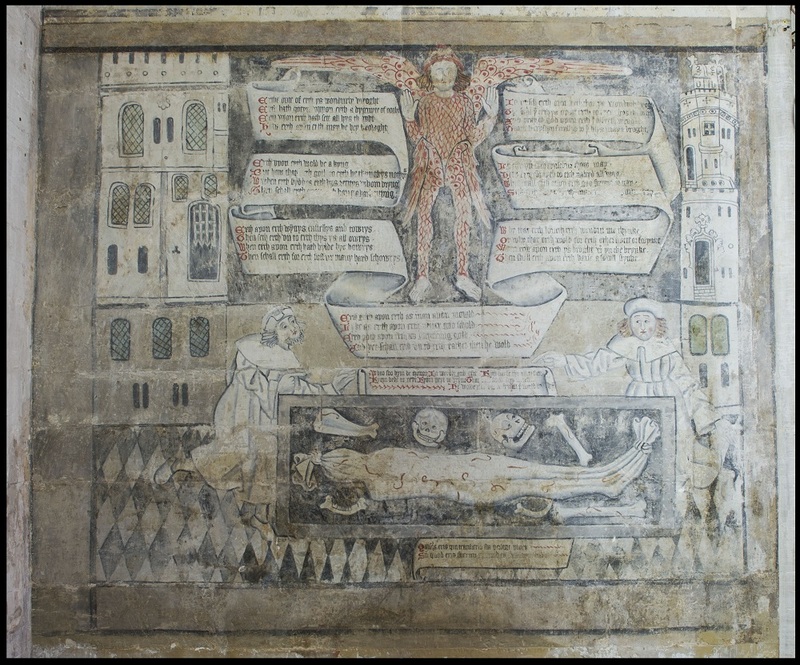 One of these paintings is ‘the Doom’ – a large ornate scene which can be seen above the Chancel arch. To medieval worshippers its imagery would have been immensely powerful, and it remains a striking centrepiece today. Doom is the Old English word for judgement and the Doom painting depicts the Last Judgement – Christ deciding the eternal destination of human lives. Doom paintings were commonplace in churches and chapels pre-Reformation; there to ensure people reflected on how they were living their lives. In the Guild Chapel’s Doom, Jesus sits on a rainbow in the centre, surrounded by four angels. Mary and St John the Baptist flank him on either side. On the left is the Kingdom of Heaven and all the good souls rising from their graves. On the right are all the sinners being tortured by demons and fed into the Mouth of Hell (depicted literally as a fanged serpentine creature which you can still clearly make out). Limewashed over post-Reformation and subsequently re-covered over the centuries, the Guild Chapel’s Doom was discovered in 1804 but remained covered until 1928 when Professor E.W Tristram had the opportunity to record and conserve it for the first time. Following its conservation in 2016 – when conservators from the Perry Lithgow Partnership undertook the painstaking process of removing later layers of limewash and paint to reveal and then consolidate the flaking medieval paint underneath – it can be seen today, clearer and brighter than it has been for hundreds of years. Sadly, the head of Christ and the four angels are currently obscured from view, having been isolated above the ceiling when it was installed in the 19th century. But they are beautifully (and tantalisingly!) preserved in the loft space. 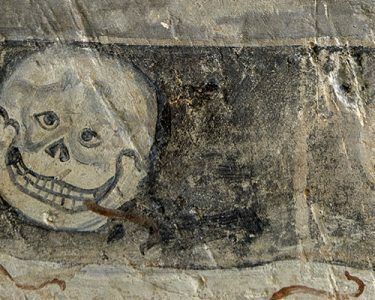 Conservators also worked on the Erthe upon Erthe Poem, also known as the Allegory of Death, the best-preserved of the Chapel’s wall paintings, found on the lower west wall. Prior to 2016 it had been hidden from view behind wooden panelling. The poem depicted in this painting occurs fairly frequently in the 15th century. It was often inserted on the spare leaves at the beginning or end of a manuscript, as well as being inscribed on walls and tombstones all over England and the south of Scotland. The earliest known texts of the poem date to the beginning of the 14th century and focus the attention on the inevitability of death and how we should all strive to lead a good life. It teaches that worldly goods should not distract us from our prayers and devotions and that we all end up equal in death and will be judged.